Dear Prof. Ullmann: A number of American and European friends have formed a committee to help Spanish refugees. I write simply to ask you to help us. For us, the Spanish Civil War is long since ended; not so for the thousands who now live in France with their families. For them the war continues, in suffering and privation. They endure poverty and illness with pride. But we should ease their condition if we can. Our help can give them medical care, the tools for making a living, the hope for a life with some dignity. Whatever you do for them will make an immediate difference in their daily lives. Help them, I beg you. And, in advance, I thank you with all my heart. Most remarkable is the date of the letter, December 18th, 1959. Camus died in a car accident just 17 days later on January 4th. wow, that's fantastic!! what a find!! Wow. What a truly remarkable find. I cannot imagine finding something like this. It would certainly take my breath away. The pied-noir plight was a focus in Elizabeth Musser's Two Crosses/Two Destinies books, the third coming out shortly. I highly recommend them. This is a real find. You must have got some serious goosebumps, finding that. 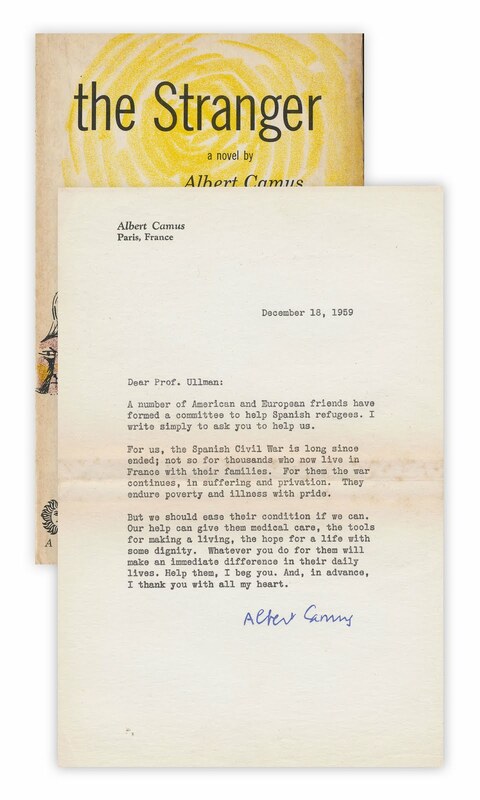 And it says something about Camus' chops that it's a pretty darn effective charity appeal letter. The randomness of everyday life never fails to amaze and delight me. I can only imagine how awestruck you were at its discovery! That it wasn't simply a friendly note but had actual historical context makes this even more of a treasure. Wow! Gives me shivers. how incredible. What a wonderful treasured find! Amazing! The past is always reaching out to us. Wow! What an awesome find! Why would you need permission to publish it, and why do you think you would be refused? Wow! That's just so amazing!